Now we are in Spring, it always makes me think about our home and the decor. If you are anything like me then I tend to make sure the house is clean and tidy but sometimes forget to make the house our home, does that make sense?. At the end of the day when the children are in bed and the dishes are done, i sit on the sofa with a nice cup of tea and that is it , I know that is for me. spending so much time in one room can honestly make it seem invisible . I am definitely a Spring girl :) I love the natural light coming into the home and If you know me personally then you won’t be surprised by my collection of orchards around the home. They definitely come out once Spring is here and I am all about pastel and floral . I think a lot of things can add to your home to give it some character - almost like a new lease of life . I have been tying to be minimalistic since it was one of my goals for this year so I am always looking to up cycle or add a touch of ‘new’ to something with simple accessories or a splash of paint. We are all different and have our own styles and let’s be honest, there are so many different styles out there to choose from, and different trends , but there is definitely something out there for everybody to decorate their homes and bring some life back Into it. The English garden style is my current favourite and we are currently making our way through the home to redecorate and swap the children’s bedrooms around. The first place I always start when it comes to decorating is my bedroom. It’s my favourite place to go when I am having some Me time , I light a candle snuggle up in bed and grab a book. I am slightly obsessed with bedding and I think every duvet set we own is floral. 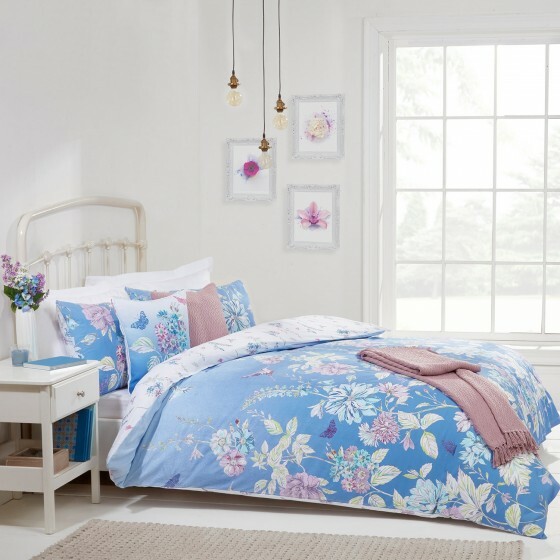 I found some gorgeous Luxury duvet covers from Julian Charles , they have all the floral which makes me happy :) . The Catrina Blue range is stunning and I think will be the theme within our bedroom. What’s your homestyle? Are you a minimalist? Or maybe live by the beach so love anything coastal when it comes to decor. I’d love to know. I am very obsessed with bedding sets. I always like the freshness of them. My mum has always been obsessed with bedding and I think she's passed this down to all of her children since all of beds have at least 15 set of sheets to them! You can never have enough! I'm really into home interiors. I try to change my style from time to time. I called mine Merry Berry for this year.